Have you chosen which races you are going to run for the year? January is the perfect time to start looking at the race schedule and deciding which races you want to conquer for 2015. For those in the northern hemisphere it is cold and dreary outside, having something to look forward to can keep your spirits up when many are fighting seasonal depression. If you are planning to run a spring marathon say in April or May, your training starts during January. Marathon training programs are sixteen to twenty weeks long. The length depends upon the experience and fitness of the runner. My runners who are going from couch to marathon get my twenty-week training program and my recommended goal is to just finish the race without injury. My runners who are active will get the sixteen week program which I adjust depending on their running experience and goals. There are many free training programs on the internet, but before you decide which one is right for you, you need to be completely honest with yourself about your current fitness level. If you are not active, but have decided that 2015 is the year of the marathon, pick a fall marathon so you have enough time to build your miles and fitness without being injured. 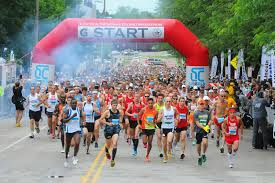 If you are hell bent on running a spring marathon to commemorate something, find a run/walk program and set your goal to finish the race before the course is closed. Twenty-six point two miles is no joke, even if it takes you six hours to finish. If you are someone who is active, but are injury prone or who doesn’t do any impact sports/activities, you should consider a less strenuous program. Look for something that starts with low miles 2-3 during week one and has only two quality workouts (speed and long run) a week or even better on a ten day rotation. If you have done marathons before and really want to bring your time down, you should pick up a sixteen week program with up to three quality runs in a week to ten day cycle, but listen to your body and don’t over train. You cannot cheat the marathon. The 5k, 10k, even a half marathon you can get through if you do “most” of your training. The marathon is different. If you don’t do the training, you will not finish the race in a good place physically. I have a marathon training program on my pages Here. It is for runners who have been running about twenty miles a week as a base. I am more than happy to post something for beginning runners and or injury prone runners. Just leave me a message in the comments or email me at Nicole@ultrarunningmom.com I’d be happy to send you something. I’m sorry to hear that. It’s hard to come back from an extended break, especially if it is cold where you are. Keep at it, don’t start with too many miles. Just ease back into things. It will come, give it time.